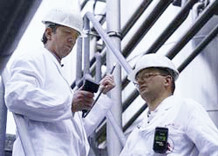 Our primary targets are long-term operative reliability as well as the profitability of your production plants. Our experts, with their experience in the practice, ensure, using efficient and systematic safety considerations, your (legal) safety. Practicians with a sound knowledge of the relevant regulations, take the company-specific issues and location-related conditions into account. Benefit from a thoroughly reliable plant as well as regular, clearly understandable documentation, which is pleasing to the supervisory authorities and the employer's liability insurance. Even if your plants have to comply with the extended obligations from the German Major Incidents Ordinance.